Hui-Zhen Li doesn’t speak English, but here she can speak freely. 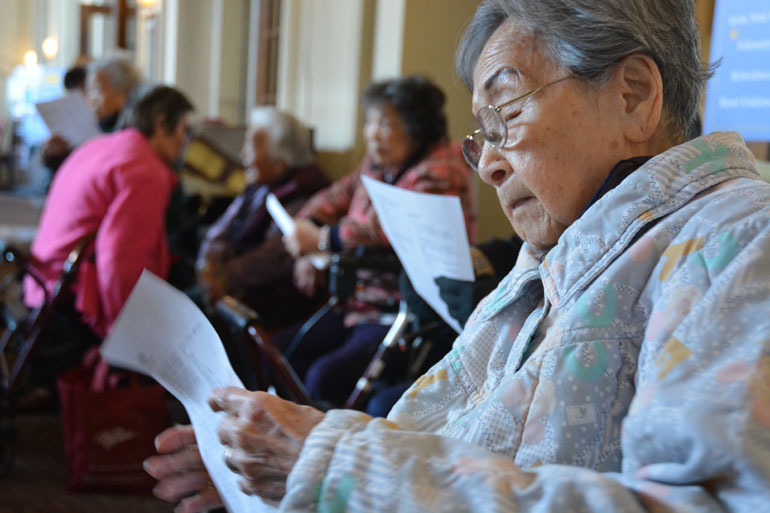 She’s standing amid more than 150 Chinese seniors, all perched on metal folding chairs or slouching in wheelchairs, packed wall to wall in the main lobby of the Hotel Oakland. Li is 89 years old, she knows her own mind, and she’s not afraid to speak it. The gathering at this low-income housing project in downtown Oakland is called Neighbors Helping Neighbors. It’s part of an ambitious plan to help elderly residents, many of them Asian immigrants, take control of their health — in part by joining at least one of 14 groups intended to enhance their physical and mental well-being. This particular meeting focuses on improving memory and warding off dementia. Other groups range from healthy eating to karaoke singing. The residents also get extensive coordination of care and personal “wellness plans” through the Hook Fong Community-Based Adult Services center next door to the hotel. Services provided by the center are funded in part by Medi-Cal, the state and federal insurance program for low-income Californians. Program managers said the integration of medical care, assistance with daily living tasks and participation in the groups has helped keep Hotel Oakland residents out of the ER and the hospital. This is the only health project of its kind in any low-income housing development subsidized by the U.S. Department of Housing and Urban Development, Hotel Oakland administrators said. They hope eventually to spread this model of care to other senior centers across the state and the nation. State health officials have expressed strong interest in melding housing and health projects, but haven’t made much headway so far. The success at Hotel Oakland could lay new groundwork for the concept in California. 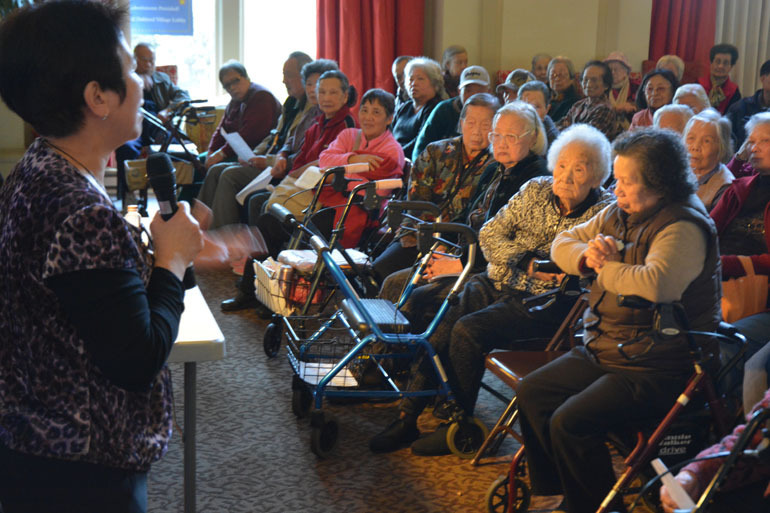 Nancy Lu, the facility’s assistant director, said the large gathering of elderly Chinese people shows just how much seniors – even wary and insular non-English-speaking seniors – want to improve their health. She motioned to the crowded, broad lobby. “They are part of all this,” she said. The property is privately owned but qualifies for federal subsidies, known as section 8, from HUD. The federal agency doesn’t pay for any of the health services; it just subsidizes the low-income housing. Tom Azumbrado, a HUD director at the agency’s Multifamily Hub in San Francisco, said what Hotel Oakland offers is more complete than other federally subsidized residences that provide some of the same services. Azumbrado said he is convinced the program at Hotel Oakland is improving seniors’ daily lives and outlook. Azumbrado added that HUD would like others to incorporate such a program in the housing projects it subsidizes. Bill Langelier, the owner of Hotel Oakland, sees his place as a model others can follow. He ponies up an additional $250,000 a year to finance some of the health care components of the facility, but he expects that cost will decrease over time. “That’s our goal, to create a model where other senior communities might scale this in some fashion,” said Langelier, a real estate investor who bought the hotel in 1979 and has developed a personal attachment to the place and its residents. He said the health program at Hotel Oakland, including coordination of care, personal wellness plans and resident-run health groups, has reduced emergency room visits by 25 percent over the past year, while cutting hospital admissions and readmissions by 17 percent each. “This is repeatable in senior properties that are affordable,” he said. Most senior facilities across the country have program directors and it would be a relatively simple matter to retrain them as wellness directors, he added. In the Hotel Oakland lobby, after the presentation on building memory, group co-leader Qi Yu Xiao asked residents to give their own perspectives. She offered a small prize as an incentive — a magenta plastic flashlight. Hsiao-Lan Kung Ting stood up. She didn’t have much interest in the flashlight, but she definitely wanted the microphone. Ting explained that her husband had been a resident at Hotel Oakland, but by the time anyone figured out what was wrong, his dementia was too far advanced. After the gathering, Ting, who also speaks English, said her life would not be what it is today without Hotel Oakland.